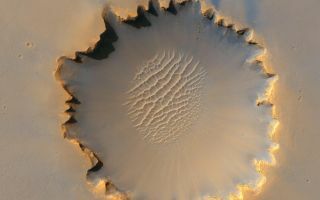 This cool space wallpaper from the High Resolution Imaging Science Experiment on NASA's Mars Reconnaissance Orbiter shows "Victoria crater," an impact crater at Meridiani Planum, near the equator of Mars. The crater is approximately 800 meters (half a mile) in diameter. It has a distinctive scalloped shape to its rim, caused by erosion and downhill movement of crater wall material. Layered sedimentary rocks are exposed along the inner wall of the crater, and boulders that have fallen from the crater wall are visible on the crater floor. The floor of the crater is occupied by a striking field of sand dunes.